James Fenimore Cooper was America's first successful popular novelist. Son of the prominent federalist William Cooper, founder of the Cooperstown settlement, James was educated at Yale in preparation for a genteel life as a federalist gentleman. After his father's death in an 1809 duel, Cooper quickly squandered his inheritance, and at thirty was on the verge of bankruptcy. He decided to try his hand at writing as a career, carefully modeling his work after Sir Walter Scott's successful Waverley Novels. His first novel, Precaution (1820), a domestic comedy set in England, lost money, but Cooper had discovered his vocation. Cooper established his reputation after his second novel, The Spy, and in his third book, the autobiographical Pioneers (1823), Cooper introduced the character of Natty Bumppo, a uniquely American personification of rugged individualism and the pioneer spirit. Emerson called Pioneers "our first national novel." 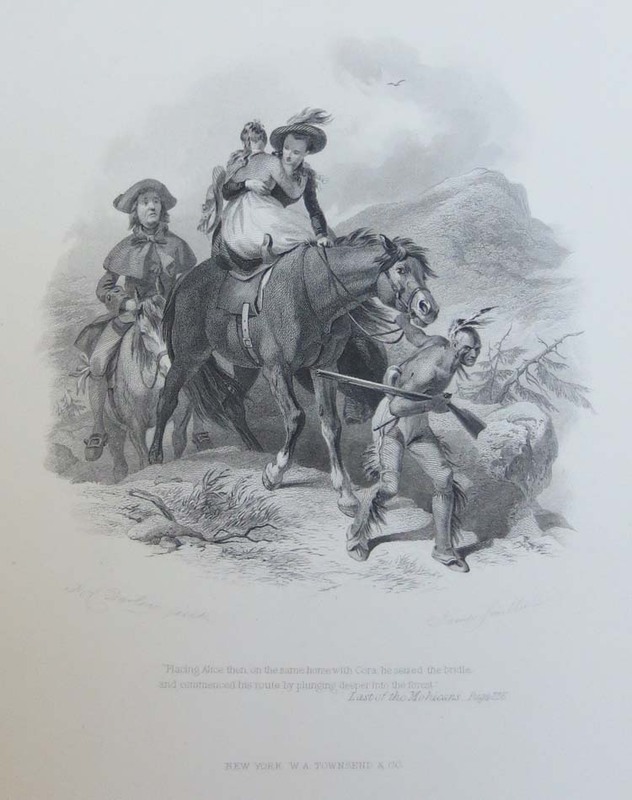 A second book featuring Bumppo, The Last of the Mohicans (1826), quickly became the most widely read work of the day, solidifying Cooper's popularity in the U.S. and in Europe. Set during the French and Indian War, The Last of the Mohicans chronicles the massacre of the colonial garrison at Fort William Henry and a fictional kidnaping of two pioneer sisters. Cooper knew few Indians, so he drew on a Moravian missionary's account of two opposing tribes; the Delawares and the "Mingos." Although this characterization was filled with inaccuracies, the dual image of the opposing tribes allowed Cooper to create a lasting image of the Indian that became a part of the American consciousness for almost two centuries. His public was simultaneously touched romantically at the doomed Indians' fate and justified in abetting their extermination. Readers were thrilled by the rapacious Magua, who fit Gothic convention and was associated with Milton's Satan. The hero Natty Bumppo was incredibly popular; a rebel heroically opposed to industrial society, he was a hero who never married or changed his ideals. Cooper was a prolific writer, publishing 32 novels, 12 works of nonfiction, a play and numerous pamphlets and articles. His most lasting contributions to American literature were his five books about Natty Bumppo, varying in genre from implausible romantic adventure to realistic narrative. Later anthologized as The Leatherstocking Tales, they are best read in the order written: The Pioneers (1823), The Last of the Mohicans (1826), The Prairie (1827), The Pathfinder (1840), and The Deerslayer (1841). Cooper's popularity declined in his later years as he entered into the nationalistic and partisan disputes of the Jacksonian era, becoming increasingly contentious toward reviewers and the public. His Leatherstocking series, however, retained their preeminence throughout the century until somewhat deflated by Mark Twain's scathing, iconoclastic review of the tales in 1895. The stories, however, continue to maintain a cultural significance in the American literary canon that goes far beyond their literary merit.